Walkable neighborhoods are important for the environment because (at least in theory) they lessen vehicular trips and thereby reduce energy consumption. I have visited The Kentlands, Seaside, Celebration and I’On. Other than Seaside, I saw few residents strolling along the walks and nobody was sitting on their front porches to wave as I walked by. What made Seaside different is that only a handful of the homes have year-round residents and it is a compact site with a central shopping district located in a nearby high-traffic area. The Kentlands and I’On have the majority of retail establishments on their borders, with I’On having a small retail village at the entrance. Celebration is the only one with minor streets feeding into a central main shopping district and a main street system. Its design is more like a master planned suburban development in which this “pod” of housing style is here and that “pod” is there. So why isn’t everyone out walking? There is a belief that architecture influences behavior patterns. If you place a front porch along the street, residents suddenly become social; the walk from the porch leads to a park that is just 5 to 10 minute's away. There is a religious zeal that drives the foundation of planning that a properly placed façade somehow changes behavior. Prefurbia recommends that both street and walk widths should be variable, determined by traffic volume. A 4-foot-wide walk serving an eight-unit townhome building is fine, but that walk should grow to 5 feet and then 6 feet when the pedestrian volume potential increases. A Smart Growth grid design with a central retail district. For this example, we did not design with alleys because they would add a considerable increase in overall paving, and blocks would have to be made larger to provide the extra space for them. To make this more of an apples-to-apples comparison, we used front-loaded porch homes with the garage setback 15 feet from the home front. Driveways are tapered to reduce their volumes. The Prefurbia design uses the same homes with the same minimums. Lots are 50-feet wide, with a 10-foot front yard setback and 5-foot side yards. In the Smart Growth plan, all residents appear to have a short trip to the store; however, only those living on the four streets that border the shopping district have a short walk. All others have to zig-zag to the shops in a walk much longer as the distance between the home porch and the destination store becomes longer. The direct distance from the most northwesterly house porch to the nearest shop is 980 feet, but the resident must walk 1,400 feet to get to the store, passing four intersections. Walking to the store also means walking back, so the total walk is 800 feet longer (30 percent) because of the grid. A Prefurbia-based Smart Growth design. The Prefurbia influenced redesign, like the Smart growth plan, did not use alleys. This plan has an 8-foot-wide main trail system that intersects at the central business district park. Residents along the trail leave their rear yard and go directly to the neighborhood retail center; other residents have convenient access to the neighborhood retail center along the street or intersecting the main trail. From the most northwesterly home to the closest retail shop both direct distance and walking distance is 980 feet. Most important is the overall environmental density of the development modified to Prefurbia pedestrian standards. The Environmental Density ratio is 45.8 percent ─ almost the same as the Smart Growth plan even though Prefurbia provides 6-foot walks with an 8-foot main trail – Smart Growth having 4-foot-wide walks. Let’s take a look at a “before and after design” that falls into the Prefurbia Neighborhood model. For this, we present a conventional suburban Texas development with retail along an arterial road to the west and residential lots of varying sizes. There are three school sites scattered within the development. The 763-acre site is projected to house 2,000 families. The dark lines (at an angle through the site) represent a minor power line, yet it controls the design of the project. The plan shown here is a maze – lacking flow, is not vehicle or pedestrian friendly – yet the city requires a 4-foot-wide walk parallel to every curb. The main trail is shown as a black circle. The planning process in a Prefurbia Neighborhood first considers the pedestrian system and is called Pedestrian Oriented Design (POD). Because of the site shape, the existing flood zone locations, the retail (shown in red) along the busy arterial street, and the demand for three school sites (shown in blue), a circular main trail made the most sense. In this instance, the main 10-foot-wide trail is exactly one mile long. The streets and meandering walk system tie to the main trail. At the major internal streets, the meandering walks are 5 feet wide, each side. Here we start seeing an overview how the systems come together on a larger scale. The traffic systems have very good flow patterns. Families easily walk about the neighborhood, even though the scale is quite large. Upon entering the main trail, one revolution is exactly a mile. What pays for all of this? There is 30 percent less infrastructure compared to the original plan. This design also allows for surface flow using less storm piping, freeing up additional money for enhancing the character and efficiency of the neighborhood. Creating pedestrian-centric neighborhoods in Prefurbia also means serving the automobile. During times of inclement weather, residents require more auto-centric design. 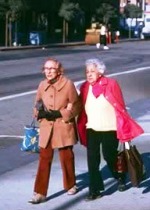 In addition, as we age, and if (when) we are injured, walking will be problematic. Pedestrian centric-only neighborhoods are not likely sustainable unless the density is extremely high – but extreme densities present other problems for sustainability. In conclusion, for walks to be an environmental solution instead of making the environment worse (underutilized walks simply add to the runoff problems); we need to create a pedestrian system that will encourage use. Only then will walks actually reduce the use of vehicles. Read the first and second installments on Environmental Protection.